The growing penetration of diverse variable energy resources (wind, solar, ...) in modern electric power systems at both the transmission and distribution (T/D) levels has increased the uncertainty of net load as well as the frequency of strong ramp events, complicating the maintenance of net load balance. In response to these trends, power system researchers and operators are proposing new market-based initiatives intended to facilitate the efficient and reliable provision of power and ancillary services from a wide array of T/D resources. The implementation of such initiatives implies tighter feedback connections between T/D system levels. Three major premises of this project are therefore as follows: First, to ensure efficient and reliable operation of future power systems, researchers need to consider with care the integrated operation of T/D systems over time. Second, researchers need to develop scalable market-based approaches that permit the efficient flexible procurement of power and ancillary services from distributed T/D resources as the number of these resources continues to increase. Third, to evaluate the technical and financial feasibility of these approaches in advance of implementation, researchers need computational frameworks that permit integrated T/D systems to be modeled and studied as coherent dynamic systems with grid sizes ranging from small to realistically large, and with an appropriate degree of empirical verisimilitude. A primary goal of this project is to investigate the ability of grid-edge resource (GER) aggregators, making use of innovative types of swing contracts, to ensure the availability and flexible real-time usage of reserve (dispatchable power paths) extracted from GERS in support of integrated transmission and distribution (ITD) system operations. This investigation will be carried out in part by means of an empirically based computational modeling of an ITD system. Based on work to date, our conjecture is that permitting swing contracting by GER aggregators and other participants in ISO/RTO-managed wholesale power markets will facilitate the robust-control management of risks and uncertainties for ITD systems. This robust control approach does not require detailed scenario and probability specifications or reliance on overly conservative worst-case designs. Title: "Market and Control Mechanisms Enabling Flexible Service Provision by Grid-Edge Resources within End-to-End Power Systems"
Title: "Flexible Service Contracting for Risk Management within Integrated Transmission and Distribution Systems"
Title: "Regional Scale Transactive System Study in the ERCOT Region of Texas"
Title: "Development of an Integrated Transmission and Distribution Test System to Evaluate Transactive Energy Systems"
Title: "Integrated Distribution and Transmission Effects of Demand-Response Initiatives"
Hieu T. Nguyen, Swathi Battula, Rohit Reddy Takkala, Zhaoyu Wang, and Leigh Tesfatsion (2019), "An Integrated Transmission and Distribution Test System for Evaluation of Transactive Energy Designs", Applied Energy, Volume 240, 666-679. Note: A preprint of this article is available (here,pdf,1.9MB). Leigh Tesfatsion (2018), "Electric Power Markets in Transition: Agent-Based Modeling Tools for Transactive Energy Support" (ScienceDirect), Chapter 13 (pp. 715-766) in Cars Hommes and Blake LeBaron (Eds. ), Handbook of Computational Economics 4: Heterogeneous Agent Models, Handbooks in Economics Series, North Holland (Elsevier), Amsterdam, the Netherlands. Wanning Li and Leigh Tesfatsion (2018), "A Swing-Contract Market Design for Flexible Service Provision in Electric Power Systems" [(WP,pdf,463KB), (Talk Slides,pdf,694KB)], Chapter 5 (pp. 105-127) in: Sean Meyn, Tariq Samad, Ian Hiskens, and Jakob Stoustrup (Eds. ), Energy Markets and Responsive Grids: Modelling, Control, and Optimization, The IMA Volumes in Mathematics and its Applications Series, Springer. Tianguang Lu, Zhaoyu Wang, Jianhui Wang, Qian Ai, and Chong Wang (2018), "A Data-Driven Stackelberg Market Strategy for Demand Response-Enabled Distribution Systems", IEEE Transactions on Smart Grid, Early Access (18 January 2018). Leigh Tesfatsion (2017), "Modeling Economic Systems as Locally-Constructive Sequential Games" [ (Preprint,pdf,654KB), (Slides,pdf,1MB)], Journal of Economic Methodology, Volume 24, Issue 4, 384-409. Dheepak Krishnamurthy, Wanning Li, and Leigh Tesfatsion (2016), "An 8-Zone Test System based on ISO New England Data: Development and Application" (pdf, 642KB), IEEE Transactions on Power Systems, Vol. 31, No. 1, January, 234-246. Zhaoyu Wang and Yanyi He (2016), "Two-stage Optimal Demand Response with Battery Energy Storage Systems", IET Generation, Transmission and Distribution, vol. 10, no. 5, April, 1286-1293. Deung-Yong Heo and Leigh Tesfatsion (2015), "Facilitating Appropriate Compensation of Electric Energy and Reserve through Standardized Contracts with Swing" (Preprint,pdf,902KB), Journal of Energy Markets, Vol. 8, No. 4, December, 93-121. Zhaoyu Wang, Bokan Chen, Jianhui Wang, and Miroslav Begovic (2015) "Stochastic DG Placement for Conservation Voltage Reduction based on Multiple Replications Procedure", IEEE Transactions on Power Delivery, Vol. 30, No. 3, June, 1039-1047. Zhaoyu Wang, Bokan Chen, Jianhui Wang, Miroslav Begovic, and Chen Chen (2015), "Coordinated Energy Management of Networked Microgrids in Distribution Systems", IEEE Transactions on Smart Grid, Vol. 6, No. 1, January, 45-53. Leigh Tesfatsion and Swathi Battula (2019), "Notes on the GridLAB-D Household Equivalent Thermal Parameter Model" (WP,pdf,819KB), Economics Working Paper No. 19001, Department of Economics, Iowa State University, Ames, IA, January. Hieu Trung Nguyen, Swathi Battula, Rohit Reddy Takkala, Zhaouyu Wang, and Leigh Tesfatsion (2018). "Transactive Energy Design for Integrated Transmission and Distribution Systems" (WP,pdf,1.4MB), Economics Working Paper No. 18004, Department of Economics, Iowa State University, Ames, IA. Wanning Li and Leigh Tesfatsion (2017), "An 8-Zone ISO-NE Test System with Physically-Based Wind Power" (WP,pdf,870KB), Economics Working Paper No. 17-2017, Department of Economics, Iowa State University, Ames, Iowa. 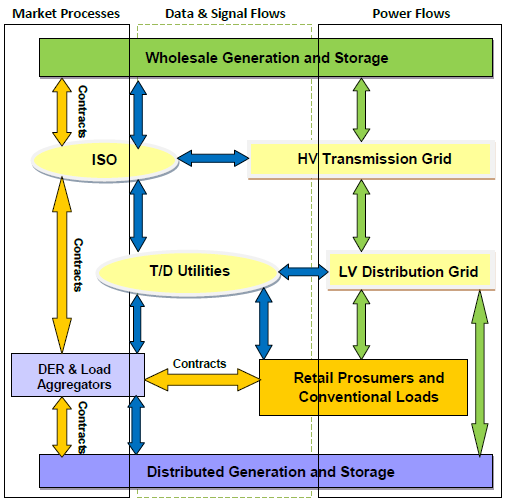 Leigh S. Tesfatsion, César A. Silva-Monroy, Verne W. Loose, James F. Ellison, Ryan T. Elliott, Raymond H. Byrne, and Ross T. Guttromson (2013), "New Wholesale Power Market Design Using Linked Forward Markets: A Study for the DOE Energy Storage Systems Program" (pdf,1.4MB), Sandia National Laboratories Report, SAND2013-2789, Unlimited Release, April. Leigh Tesfatsion, "Market and Control Mechanisms Enabling Flexible Service Provision by Grid-Edge Resources within End-to-End Power Systems", Power Systems Engineering Research Center (PSERC) IAB Meeting, UC Berkeley, Dec 5-7, 2018. Leigh Tesfatsion, Keynote Address: "Agent-Based Modeling Support for Institutional Design", CSS 2018, The Computational Social Science Society of the Americas, Santa Fe, New Mexico, Oct 25-28, 2018. Shanshan Ma, Zhaoyu Wang, and Leigh Tesfatsion, "Swing Contracts with Dynamic Reserves for Flexible Service Management", IEEE Power & Energy Society General Meeting (GM 2018), Portland, OR, Aug 5-9, 2018. Leigh Tesfatsion, "Theory Development Through Agent-Based Modeling" (webinar), Symposium I: State of the Art & Epistemological Perspectives on Theory Development Through Agent-Based Modeling, Hannover, Germany, July 4-6, 2018. Leigh Tesfatsion, "Swing Contract Transactive Energy System Designs for End-to-End Power Systems", Hybrid Economic-Control Theory Workshop, MIT, Cambridge, MA, June 11, 2018. Zhaoyu Wang, "Agent-Based Modeling for Integrated Transmission and Distribution Test Systems", 2018 IEEE PES T&D Conference and Exposition, Denver, CO, April 16-19, 2018. Leigh Tesfatsion, "Electric Power Markets in Transition: Agent-Based Modeling Tools for Transactive Energy Support" Invited Talk (via Skype), Invenia Labs, Cambridge, UK, March 22, 2018. Zhaoyu Wang, "Integrated Transmission and Distribution Test Beds", Invited Talk, University of Bath, Bath, UK, January 16, 2018. Leigh Tesfatsion, "Modeling Coupled Natural and Human Systems as Locally-Constructive Sequential Games", Invited Talk (Skype), ABM Seminar, University of Minnesota, Mpls., November 8, 2017. Zhaoyu Wang, "Integrated Wholesale and Retail Power System Testbeds", Invited Talk, Springfield City Utilities, Springfield, MO, October 19, 2017. ITD Project Team (via Skype), "Transactive Energy System Designs for End-to-End Power Systems with Massively Distributed Energy Resources", PNNL TESP Workshop, Richland, WA, October 16, 2017. Leigh Tesfatsion, "Agent-Based Modeling Tools for Electric Power Market Design: Implications for Macro/Financial Policy", Heterogeneous Agents and Agent-Based Modeling: The Intersection of Policy and ResearchM, Joint Conference of the Office of Financial Research (U.S. Treasury), Brandeis University, and the Bank of England, held at U.S. Treasury, Washington, D.C., September 21-22, 2017. Leigh Tesfatsion, "Electric Power Markets in Transition: Agent-Based Modeling Tools for Transactive Energy Support" (via Skype), Amsterdam Business School, Amsterdam, the Netherlands, June 1, 2017. Zhaoyu Wang, "DOE Project Research Summary", Electric Power Research Center IAB Meeting, Iowa State University, May 14, 2017. Leigh Tesfatsion, "Modeling Economic Systems as Locally Constructive Sequential Games", Social Behavioral Modeling and Simulation Workshop, Sponsored by the Defense Advanced Research Project Agency (DARPA), RAND Corporation, Santa Monica, CA, April 3-4, 2017. Leigh Tesfatsion, "Economic Systems as Constructively Rational Games: Oh, the Places We Could Go! ", International Congress on Agent Computing, George Mason University, Nov 29-30, 2016. Leigh Tesfatsion, Keynote Address, "Economic Systems as Constructively Rational Games: Oh, the Places We Could Go! ", Economics in the Era of Natural Computation and Big Data, Duke Forest Conference, Durham, North Carolina, Nov. 11-13, 2016. Auswin G. Thomas and Leigh Tesfatsion, "Using Test Systems to Explore Integrated Transmission and Distribution System Operations with SmartGrid Functionality: A Demand- Response Illustration", IEEE PES General Meeting, Boston, MA, July 17-21, 2016. Wanning Li and Leigh Tesfatsion, "Market Provision of Flexible Energy/Reserve Contracts: Optimization Formulation", Proceedings, IEEE PES General Meeting, Boston, MA, July 17-25, 2016. Wanning Li and Leigh Tesfatsion, "Market Provision of Flexible Energy/Reserve Contracts", FERC Technical Conference, Washington, D.C., June 27-29, 2016. Leigh Tesfatsion, "Facilitating Flexible Service Provision in Electric Power Markets via Swing Contracting", Control at Large Scales: Energy Markets and Responsive Grids, Institute for Mathematics and its Applications (IMA), Mpls, May 9-13, 2016. Steve Widergren, Koen Kok, and Leigh Tesfatsion, "Transactive Energy Systems", Webinar, IEEE SmartGrid, 10 March 2016. Koen Kok, Steve Widergren, and Leigh Tesfatsion, "Intelligent Systems Support for Transactive Energy Systems: The Fundamentals", Half-Day Tutorial, IEEE Power and Energy Society General Meeting, Denver, CO, July 26-30, 2015. Leigh Tesfatsion and Deung-Yong Heo, "Facilitating Appropriate Compensation of Electric Energy and Reserve Through Standardized Contracts with Swing", Panel Session: Effects of Contract Design on Electricity Market Performance with Increased Penetration of Distributed Energy Resources and Variable Generation, IEEE Power and Energy Society General Meeting, Denver, CO, July 26-30, 2015. Auswin G. Thomas and Leigh Tesfatsion, "Integrated Transmission and Distribution Effects of Demand-Side Participation", Panel Session: Wholesale and Retail Market Interaction Requirements for Effective Demand-Side Participation, IEEE Power and Energy Society Meeting, Denver, CO, July 26-30, 2015. An ISU research team has developed an open source 8-Zone ISO-NE Test System based on structural attributes and data from the ISO New England (ISO-NE). The Java/Python code for this test system, together with data for an illustrative test case, can be found here: code/data repository site. Dheepak Krishnamurthy, Wanning Li, and Leigh Tesfatsion, "An 8-Zone Test System based on ISO New England Data: Development and Application" (Preprint,pdf,642KB), IEEE Transactions on Power Systems, Vol. 31, Issue 1, January 2016, 234-246. Abstract: This study develops an open-source 8-zone test system for teaching, training, and research purposes that is based on ISO New England structural attributes and data. The test system models an ISO-managed wholesale power market populated by a mix of generating companies and load-serving entities that operates through time over an 8-zone AC transmission grid. The modular extensible architecture of the test system permits a wide range of sensitivity studies to be conducted. To illustrate the capabilities of the test system, we report energy cost-savings outcomes for a comparative study of stochastic versus deterministic DAM Security Constrained Unit Commitment (SCUC) formulations under systematically varied reserve requirement levels for the deterministic formulation. Wanning Li and Leigh Tesfatsion, "An 8-Zone ISO-NE Test System with Physically-Based Wind Power," (WP Preprint,pdf,870KB), Economics Working Paper No. 17017, Department of Economics, Iowa State University, January 2017. Abstract: This study extends the agent-based 8-Zone ISO-NE Test System to include wind turbine agents, each characterized by location, physical type, and an output curve mapping local wind speed into wind power output. Increases in wind power penetration (WPP) are modeled as build-outs of investment queues for planned wind turbine installations. The extended system is used to study the effects of increasing WPP under both stochastic and deterministic day-ahead market (DAM) formulations for security-constrained unit commitment (SCUC). For each tested WPP, the expected cost saving resulting from a switch from deterministic to stochastic DAM SCUC is found to display a U-shaped variation as the reserve requirement (RR) for deterministic DAM SCUC is successively increased. Moreover, the RR level resulting in the lowest expected cost saving systematically increases with increases in WPP. The AMES Wholesale Power Market Test Bed, developed in Java/Python, is an extensible and modular agent-based computational laboratory for studying the dynamic efficiency and reliability of wholesale power markets structured in accordance with guidelines issued by the U.S. Federal Energy Regulatory Commission. AMES is an acronym for Agent-based Modeling of Electricity Systems. AMES models strategically-learning traders interacting over time in an ISO-managed wholesale power market operating over an AC transmission grid subject to congestion effects. Congestion on the grid is managed by means of locational marginal prices derived from optimal power flow (OPF) solutions for bid/offer-based DC-OPF optimizations. AMES is a free open source tool suitable for research, teaching, and training applications. It is designed for the intensive experimental study of ISO-managed wholesale electric power systems operating over small to medium-sized AC transmission grids. AMES permits: (i) the creation and storage of load scenarios; (ii) specification of behavioral rules (e.g., bid/offer methods, learning methods) for market participants; (iii) parameter initialization and editing (e.g., for generator cost functions); and (iv) output reports through table and chart displays. AMES software downloads, manuals, tutorials, and publications can be accessed at the AMES Homepage. David P. Chassin, Jason C. Fuller, and Ned Djilali, GridLAB-D: An Agent-Based Simulation Framework for Smart Grids (pdf,2.9M), Journal of Applied Mathematics, Vol 2014, Article ID 492320. NAS, Analytic Research Foundations for the Next-Generation Electric Grid (pdf,9.3MB), National Academies of Science, The National Academies Press, Washington, D.C., 2016. Philipp Ringler, Dogan Keles, Wolf Fichtner, "Agent-Based Modelling and Simulation of Smart Electricity Grids and Markets - a Literature Review" (DOI Link), Renewable and Sustainable Energy Reviews 57 (2016),205-2015. Maria Lorena Tuballa and Michael Lochinvar Abundo, "A Review of the Development of Smart Grid Technologies" (DOI Link), Renewable and Sustainable Energy Reviews 59 (2016), 710-723. Note: This power economics course has been designed for long-distance access. All lecture notes and assigned readings are posted on-line. The Midcontinent Independent System Operator (MISO) maintains a MISO Dynamic LMP Contour Map for real-time LMPs, updated every five minutes, accompanied by information in chart and tabular form. The New England Independent System Operator (ISO-NE) maintains a ISO-NE Dynamic LMP Contour Maps for both day-ahead and real-time LMPs, refreshed every five minutes. Note: Viewing the contour maps at this site requires a Java-enabled browser. The New York Independent System Operator (NYISO) maintains NYISO LMP Contour Maps for both day-ahead and real-time LMPs, refreshed every two minutes. Note: Viewing the contour maps at this site requires a Java-enabled browser.